The AIRS Level 1B Near Real Time (NRT) product (AIRIBRAD_NRT_005) differs from the routine product (AIRIBRAD_005) in 2 ways to meet the three hour latency requirements of the Land Atmosphere NRT Capability Earth Observing System (LANCE): (1) The NRT granules are produced without previous or subsequent granules if those granules are not available within 5 minutes, (2) the predictive ephemeris/attitude data are used rather than the definitive ephemeris/attitude. The consequences of these differences are described in the AIRS Near Real Time (NRT) data products document. 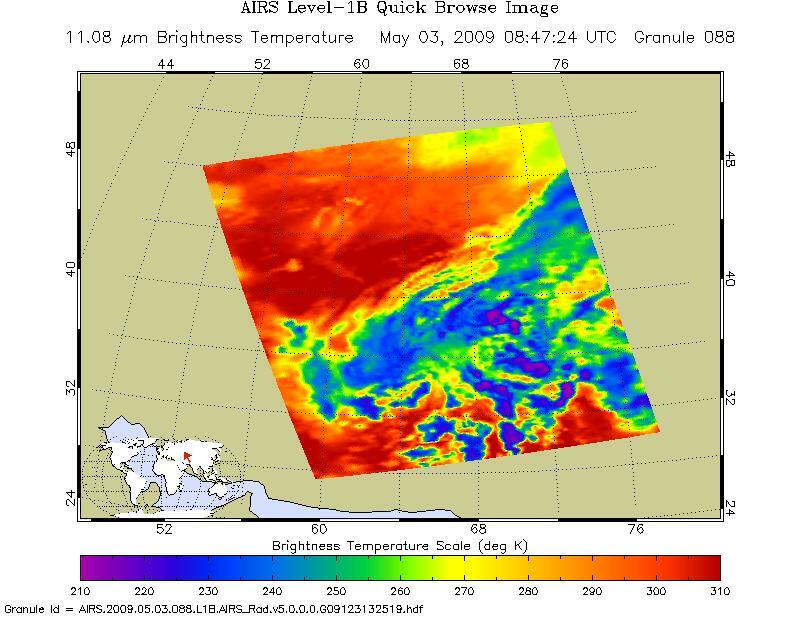 The Atmospheric Infrared Sounder (AIRS) is a grating spectrometer (R = 1200) aboard the second Earth Observing System (EOS) polar-orbiting platform, EOS Aqua. In combination with the Advanced Microwave Sounding Unit (AMSU) and the Humidity Sounder for Brazil (HSB), AIRS constitutes an innovative atmospheric sounding group of visible, infrared, and microwave sensors. The AIRS Infrared (IR) level 1B data set contains AIRS calibrated and geolocated radiances in milliWatts/m^2/cm^-1/steradian for 2378 infrared channels in the 3.74 to 15.4 micron region of t he spectrum. The AIRS instrument is co-aligned with AMSU-A so that successive blocks of 3 x 3 AIRS footprints are contained within one AMSU-A footprint. The AIRIBRAD_NRT_005 products are stored in files (often referred to as "granules") that contain 6 minutes of data, 90 footprints across track by 135 lines along track.